Iniesta will play at the Camp Nou for the last time on Sunday. Nike wanted to pay homage to him with some exclusive boots. After 22 years as a blaugrana, the Spanish international has been a Club icon and he represents the values and style of play. The blaugrana captain will have new boots for the game against Real Sociedad in a special game. It will be a night full of tributes to the Barça captain. There will be a mosaic at the Camp Nou before the match. The graceful movement of Iniesta will be easy to pick up with his white boots with blaugrana details. 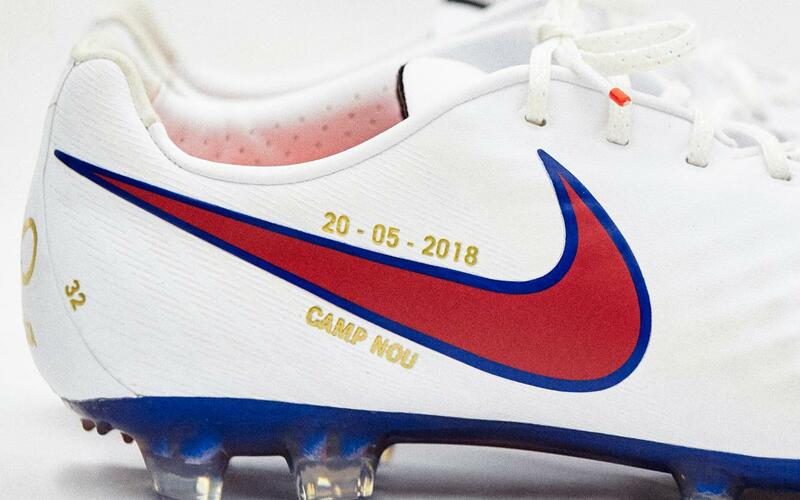 The captain’s boots will have the date of the ‘29-10-2002’, the day he debuted with the first team against Bruges; and the ‘20-05-2018’, the date of his last game at the Camp Nou, as well as an FC Barcelona shirt. The boots will be an exclusive and unique model, which are a present from the sports company for a player who has played for FC Barcelona for his whole career.